(CNN) -- China's and Japan's top leaders met in Belgium, indicating a thaw in relations since a diplomatic battle broke out last month over Japan's arrest of a Chinese fishing captain off the disputed Diaoyu Islands. Chinese Premier Wen Jiabao and Japanese Prime Minister Naoto Kan met Monday in Brussels, on the sidelines of the Asia-Europe Meeting. They met in a corridor outside the conference venue after a working dinner and spoke for about 25 minutes, Kan told reporters, according to Japan's Kyodo news agency. During the meeting, Wen stressed the mutual benefits of Beijing and Tokyo maintaining good relations, according to China's state-run media. Kan said likewise, Kyodo said. Wen and Kan "agreed to step up people-to-people exchange and communication between the governments, and hold China-Japan high-level meeting at an appropriate time," according to the Xinhua news agency. Wen also reiterated China's claims to the Diaoyu Islands, China's state-run media said. Kan told Wen that the islands are an integral part of Japanese territory, Kyodo said. The Japanese call the islands the Senkaku. The arrest of the fishing captain in early September off the islands touched off a battle that escalated into diplomatic threats by Beijing, the suspension of ministerial-level talks and canceled trips between the nations. Beijing says the islands and most of the South China Sea belong to China, disputing neighboring countries' claims. The clash over territorial waters and islands -- and the natural resources that go with them -- is a flash point in the Asia-Pacific region. Japan late last month freed the fishing captain, who returned to a hero's welcome in China. During the dispute, China arrested four Japanese nationals, saying they were being investigated for illegally entering a Chinese military zone. 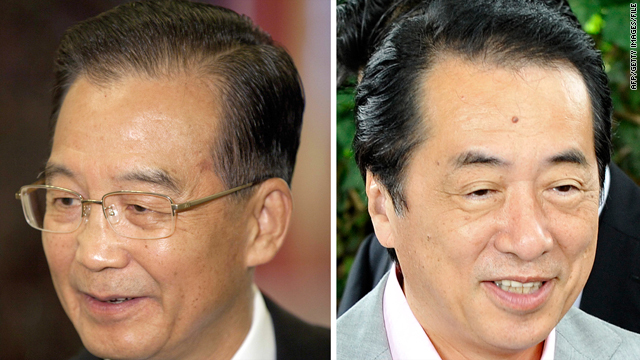 China released three of the four Japanese last week, saying they had made admissions and expressed regret. China continues to hold the remaining Japanese national. Their employer, the Japanese construction company Fujita Corp., has said that they were sent to China for a Japanese government project to reclaim World War II chemical weapons left by Japan's Imperial Army.